A bridal shower chocoholic theme party is a perfect idea for the true chocolate lover. She lists "anything chocolate" in the top five items she can't live without. So, think about how sweet it will be planning this party! Once you decide on this theme, there are many options from which to choose. You might want to have a light lunch and add a decadent dessert. You may decide to offer a "desserts only" buffet. Depending on the time of year, you could choose hot cocoa and cookies. It's up to you. • The location you choose can be inside or out, but the aroma of the chocoholic theme party lends itself to an indoor site. • Invitations in the shape of a heart, a Hershey's kiss, or a favorite candy bar design, are all appropriate. 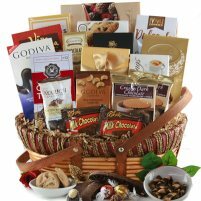 If desired, politely suggest bringing a gift that's related to the bridal shower chocoholic party theme. If you plan to do any baking or candy making, advise guests to wear casual dress. • Decorations for this theme can be any color scheme. Metallic gold or silver items work well as a contrast to anything chocolate. Heart themed decorations are appropriate. Hang streamers and balloons around the room. A chocolate fountain makes a great centerpiece. • Don't forget paper goods for your bridal shower chocoholic theme party. Chocolate scramble. Prepare ten words related to your bridal shower chocoholic theme party. Mix them up, and have them written on paper, to be handed to guests. all ten words, wins a prize. • a chocolate fountain: surround with strawberries, bananas, and pound cake cubes, for dipping. • Choose a hot or cold punch recipe to offer guests. • See more theme ideas. • Go from chocolate theme page, to Bridal Shower Ideas For You homepage.